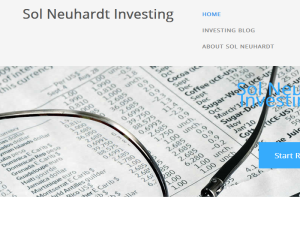 Sol Neuhardt is very interested in the discipline it takes to become a successful investor these days. So he will be posting various articles related to the investing industry in a brand new blog! This blog is meant to help interested persons learn and to help Sol organize his own thoughts on the topic. Solomon Neuhardt is a disciplined attorney from Montana. His other interests include tennis, skiing and cars. This what your Solomon Neuhardt Investing Blog Blog Ad will look like to visitors! Of course you will want to use keywords and ad targeting to get the most out of your ad campaign! So purchase an ad space today before there all gone! If you are the owner of Solomon Neuhardt Investing Blog, or someone who enjoys this blog why not upgrade it to a Featured Listing or Permanent Listing?